What follows are a number of testimonials from our satisfied clients. Please feel free to submit your own, below! “Hello! Just wanted to say Thank You Jessica for all your assistance with the cruise last week we had a fantastic time and met Nikki who was wonderful. We had a blast and please keep us in mind for any upcoming trips. “Hello Nikki. I just wanted to say Thank You so much we had a fabulous time on the Oasis. The cocktail party was great and much appreciated along with the goodie bag which came in handy. We were lucky with the great weather and had a blast both on and off the ship, in addition to taking advantage of many shows and casino fun. Hope you too enjoyed. Please keep us in mind for upcoming trips Now back to the cold. I just want to take some time to say Thank You very much for the wonderful room and food at Caesar’s. 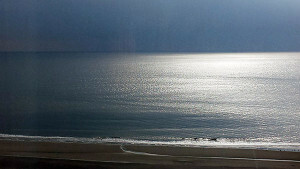 Attached a pic of the view from the room where I just relaxed and enjoyed the moment. 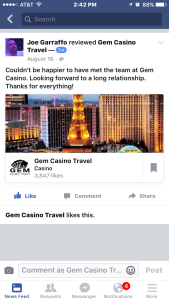 “Gem Casino has done an outstanding job of arranging many visits for me and my wife to Atlantic City and other casino venues over a ten year period. Not only do they make arrangements but they are always there to follow up in case of a misstep. 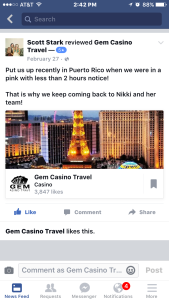 In addition to casino trips in the U.S.A. they have also arranged many out of the country trips to Puerto Rico and the Dominican Republic. You guys ROCK! I have to say that my last trip to Vegas was outstanding. The Palms is fabulous!!! If we wanted to go back, do you think they would give us a Suite again? We’d love to go back next weekend (Thurs-Sun) or June 12-15. Please let know what you can do. 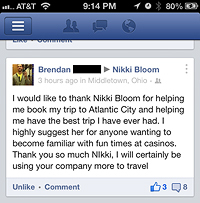 “I enjoyed the video and was nice to put a face to Nikki, since I spoke to you many times in the past. Anyway I just want you to know I still refer your name out quite a bit. I wish I dealt with you from the time I started playing. You guys are the best. As you say on the video you are a one stop shop, which is great. If you ever need a reference, I would be glad to assist. Over the recent years you guys have been great for me, I can only imagine how well you treat your “real” players. I wish you all continue success. I’m sure you will hear from me in the future! “Just viewed your news spot on YouTube. It was nice to place faces to those of you I have talked with (and emailed). Joe and I are looking forward to your Fall trip to Laughlin (Fred and Pat C. are also interested in traveling with us). Just watched the video done by the Valley View News, very nice congratulations! Hope all is well.I watched the piece you sent with you and Nikki.I thought it was great.It was detailed and friendly. Also, any advertizing that is free is great .I spend 250k/month on ads and don’t get 6 minutes on air. I’ll be in touch, I want to book something with you guys in a bit. It’s the second time when i’ve seen your site. I can gather a lot of hard work has gone in to it. It’s really good. and then had to slow down a little bit, I have! Instead of begging some guy or girl for some comp who may or may not give it you, Gem takes care of the small issues! I strongly suggest to Canadian’s and American’s to use Gem they make it easy and we all like it easy! I have visited many wonderful places because of Gem’s great crew from top to bottom like Atlantis approx 10 times, Las Vegas to many to count, Atlantic City 100’s of times, Niagara Falls Ontario, Montreal Quebec Canada, Windsor Canada, New Orleans and someday soon will be St. Kitts or Domincan Republic. Just wanted to say thank you to Joe DeRosa for setting us up at Caesars in A.C. We’ve worked with him before so knew he would take care of us this time around. 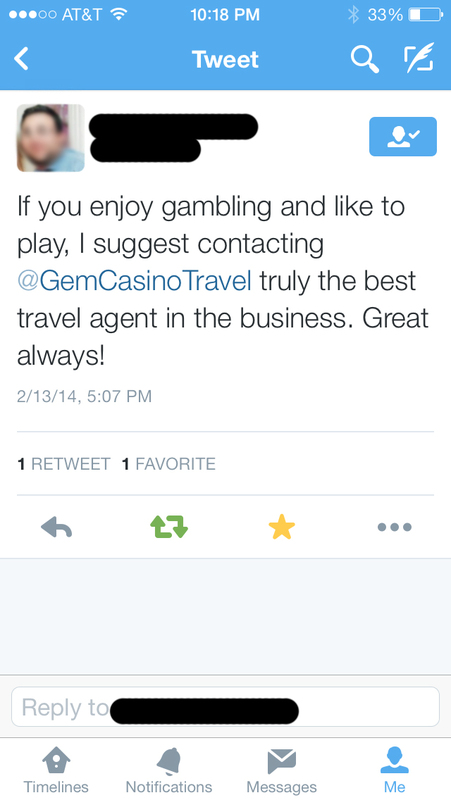 Had a good time at Caesars, and we’re planning on contacting him again the next time we head back. He suggested we try Harrahs as well, so that’s what we’ll probably do. Thanks again Joe. Thanks so much to Joe DeRosa for helping us with our recent trip to Atlantic City. As always, Joe made sure everything was in order for our trip and we had an amazing time. 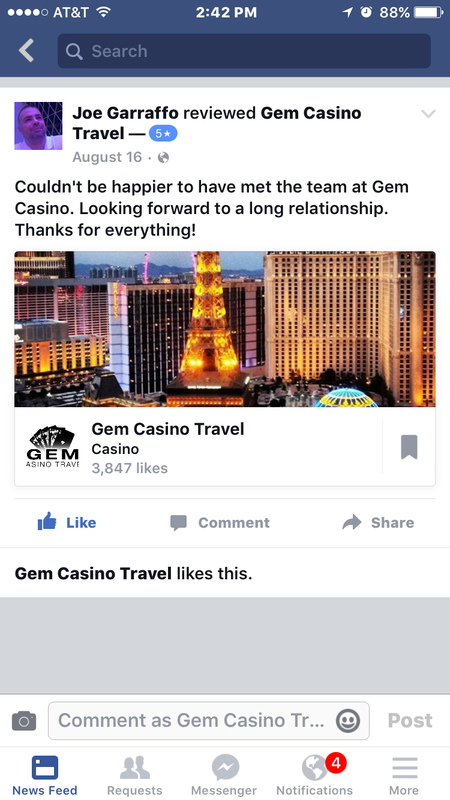 We will certainly be using Joe and Gem Casino for future trips. Thanks, Joe-You’re the best! Joe DeRosa and his team have always been very pleasant and helpful to me. I enjoy the atmosphere at Atlantic City but sometimes I need help arranging a trip.That is when Joe steps in to help me. We had a wonderful Las Vegas trip! This was our first time using this service and really appreciated the help we received from Joe. Joe made our reservations for us and we ended up with our family joining us for vacation 3 rooms down from us in the nicer tower! We all flew in Xmas day on the same flight and ended up taking a tour to California one day and the Grand Canyon another day. Thanks Joe (GEM Casino trips) Atlantic City! 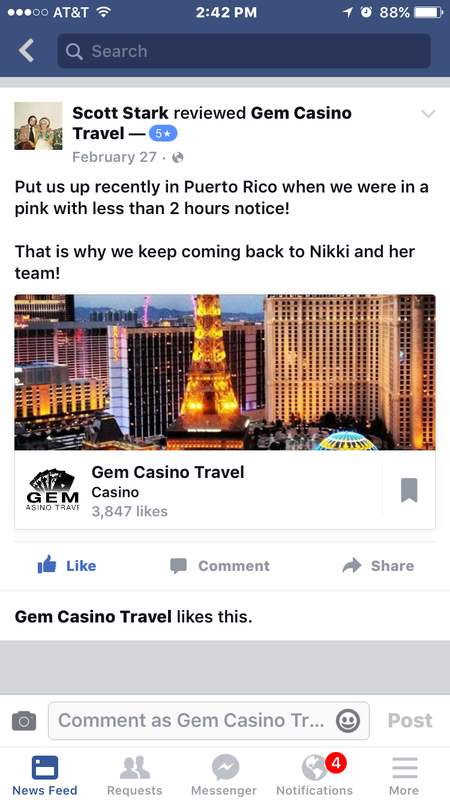 I just wanted to quickly thank Nikki Bloom and Gem for always providing top notch service and treating my wife over and beyond what we have ever experienced from any casino host. 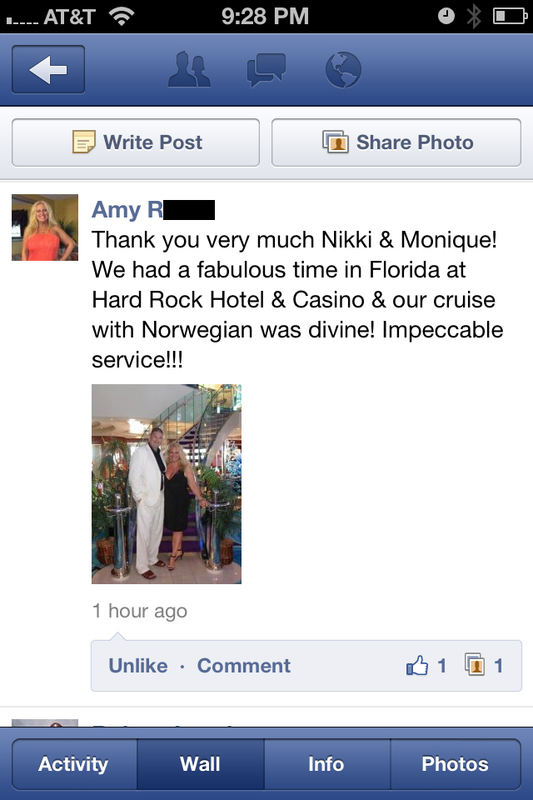 Not only have I made a true friend in Nikki and Gem but I can always rely and count on her for anything I need in any state, country or cruise. (Don’t call it a boat, Nikki gets mad ha). Thank you as always. We will always be a Gem! You can include images or files in your comment by selecting them below. Once you select a file, it will be uploaded and a link to it added to your comment. You can upload as many images or files as you like and they will all be added to your comment. If you would like to add a video from a source such as YouTube, embed the code in the comment field above rather than using this upload interface.